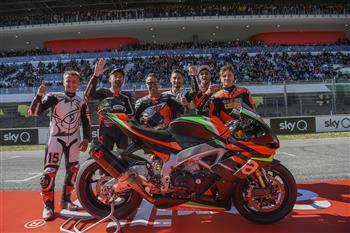 It was a huge celebration of enthusiasts who responded en masse to the call from Aprilia, a young and Italian brand that lives and breathes passion for motorcycles and racing, more alive than ever with a fantastic fan base and with the capacity to thrill and excite as it always has throughout its history. More than ten thousand people descended on Mugello for the first edition of Aprilia All Stars, the day on which Aprilia celebrated its past and future, introducing the new 217 HP RSV4 1100 Factory to the public along with the MotoGP team. This new bike is a concentration of technology and racing know-how expressed to an even further extreme in the X version which, created for the tenth birthday of the RSV4 project, reaches 225 HP and a weight of 165 Kg. These are two bikes that bear witness to the extraordinary bond between the Aprilia product and its Racing department which, backed by 54 world titles won, including seven in WSBK and 294 GP wins, is a true technological banner for the Piaggio Group and for the entire Italian motorcycling movement. It was the FMI president, Giovanni Copioli, who acknowledged this role, awarding Piaggio Group CEO and MD Roberto Colannino on the track during the MotoGP team presentation. The Aprilia Racing Team Gresini were on track with the 2019 RS-GP machines which made their début two weeks ago in Qatar, ridden by Andrea Iannone and Bradley Smith, who were the same riders to unveil the new Aprilia RSV4 versions which were then taken out on track by an extraordinary crew of Champions in the Aprilia World: Max Biaggi, Loris Capirossi, Manuel Poggiali, Alex Gramigni and Roberto Locatelli. Biaggi's parade lap astride his 1995 world championship RS 250, the sensational race with all the riders astride Aprilia SR 150 scooters, won in the final stretch by Manuel Poggiali and the display in pit lane of the bikes that have written Aprilia racing history filled an extraordinary day on which the public of Aprilia fans were protagonists. Participants ranged from those who are simply fans of the Italian brand, filling the grandstands and paddock that was livened up by music and games to the hundreds of fans in the Bearacer community who were able to meet the riders and share in a day of celebration with the entire team. And at the end, there was a spectacular parade of Aprilia bikes that invaded the circuit, the same track where the bikes from Noale, the most victorious bikes on the Tuscan hillside, have triumphed no less than 23 times in World GP races. More than ten thousand people descended on Mugello for the first edition of Aprilia All Stars, the day on which Aprilia celebrated its past and future, introducing the new 217 HP RSV4 1100 Factory to the public along with the MotoGP team.